A geophysicist studies Earth’s structure and properties. Geophysicists use a variety of methods, but often use gravity, magnetic, and seismic methods. Geophysicists apply their work to many different types of study. Some are finding energy resources such as oil and rocks that contain valuable elements such as nickel, copper, and rare earth elements. Some geophysicists are assessing earth properties for environmental hazards while others may look at subsurface conditions for construction. Research geophysicists study the internal structure of the Earth, how the Earth has changed over time, motion of the plates on the Earth’s surface, earthquakes, and other features of the Earth. Use gravity, magnetic, electrical, and seismic methods to study the Earth. Find mineral resources such as oil, gold, and other minerals. Assess Earth properties for hazards and for construction of structures such as dams. Research the internal structure and evolution of the earth. One way geophysicists use sound is when they study the internal structure of the earth. Sound is used to map and characterize rock and sediment layers under the ocean. The layers of the seafloor are examined with seismic reflection and seismic refraction (also called wide angle seismics). Echosounding is a basic type of seismic reflection used to measure the depth of the water. A sound pulse is sent from a ship and that sound reflects off the seafloor and returns to the ship. The time the sound takes to travel to the bottom and back is used to calculate the distance to the seafloor. Seismic reflection and refraction use a stronger sound signal and lower sound frequencies (10-50 Hz) than echosounding in order to look deeper below the seafloor. The sound pulse is often sent from an air gun array towed behind a slowly moving ship. An airgun uses the sudden release of compressed air to form bubbles. The bubble formation produces a loud sound that travels to the seafloor. Some of the sound reflects off the seafloor but some of the sound penetrates the seafloor sometimes as much as 20-30 km below it depending on how the array is designed. The sound that penetrates the seafloor may also reflect off layers of sediment or rock within the seafloor. The reflected sounds travel back up to the surface. 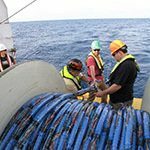 The ship also tows a number of hydrophones (called a towed array or streamer), which detects the reflected sound signal when it reaches the surface. They use many hydrophones to hear weaker reflections from deeper in the Earth. Sound can also be used to detect and monitor underwater earthquakes and underwater volcanic eruptions. USGS: What is a Geophysicist?